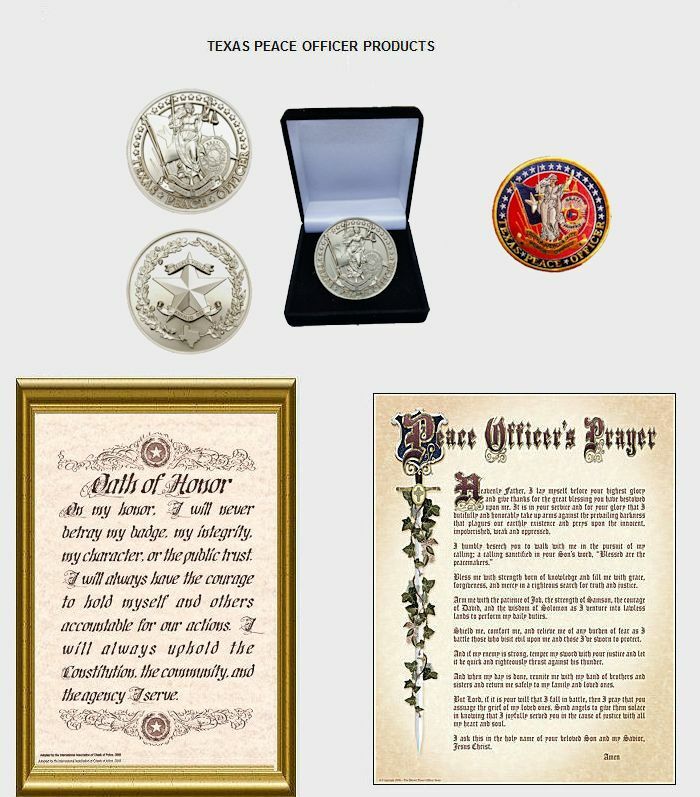 The Master Peace Officer Store is where you can find commemorative keepsakes and gifts designed especially for the Texas Master Peace Officer. 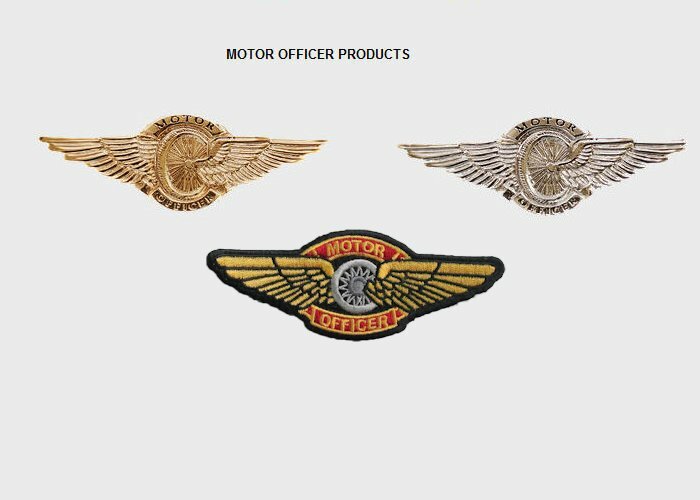 These gifts elegantly exemplify your accomplishment of being awarded the honor and title of Master Peace Officer. They have a definite "Texas" look about them and are of the highest quality and workmanship. They will look outstanding mounted and displayed in your home or office. DISCLAIMER OF ENDORSEMENT: Any reference obtained via this server, including e-mail from this server, to a specific commercial or non-commercial product, process, or service does not constitute or imply an endorsement by the Texas Commission on Law Enforcement Officer Standards and Education (T.C.L.E.O.S.E.) or the State of Texas of: “THE MASTER PEACE OFFICER STORE” or its products, processes, or services. 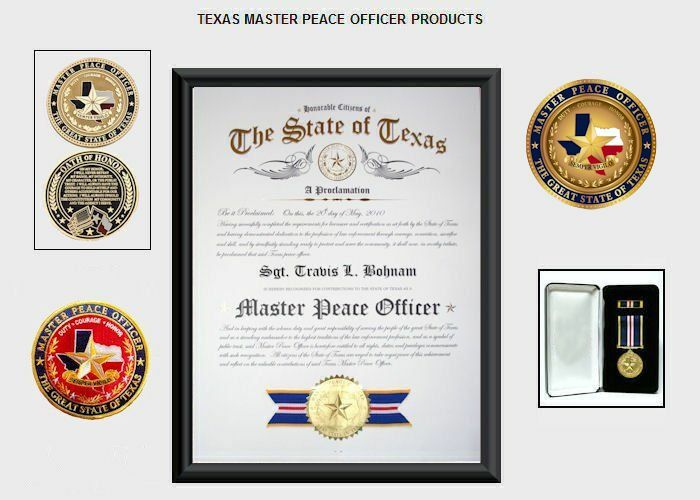 The views and opinions expressed on this Web site and in any products offered by “THE MASTER PEACE OFFICER STORE” do not necessarily state or reflect those of the Texas Commission on Law Enforcement Officer Standards and Education or the State of Texas. DISCLAIMER OF LIABILITY: Neither the Texas Commission on Law Enforcement Officer Standards and Education, nor the State of Texas, nor any of its employees, makes any warranty, express or implied, including warranties of merchantability and fitness for a particular purpose, or assumes any legal liability for the accuracy, completeness, usefulness, or electronic delivery of any information from this server, links to servers that appear on this Web site, or e-mail generated from this server.